TOOT! TOOT! YER TIRE’S FLAT! 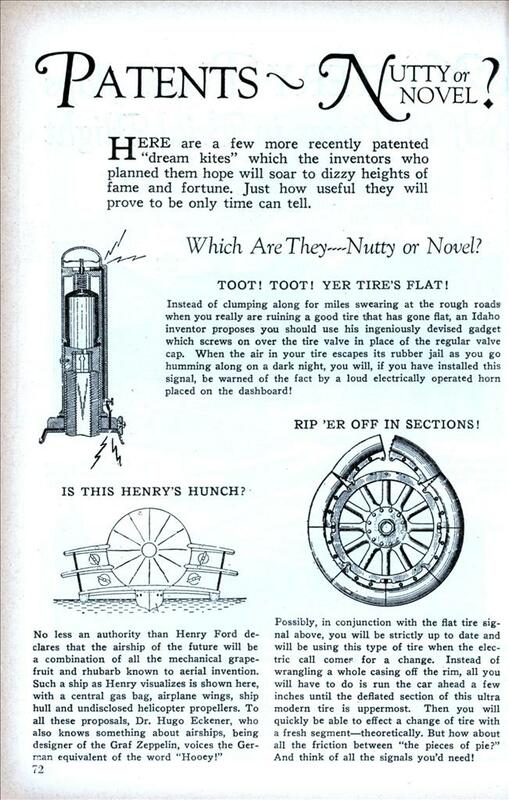 Instead of clumping along for miles swearing at the rough roads when you really are ruining a good tire that has gone flat, an Idaho inventor proposes you should use his ingeniously devised gadget which screws on over the tire valve in place of the regular valve cap. When the air in your tire escapes its rubber jail as you go humming along on a dark night, you will, if you have installed this signal, be warned of the fact by a loud electrically operated horn placed on the dashboard! RIP ‘ER OFF IN SECTIONS! Possibly, in conjunction with the flat tire signal above, you will be strictly up to date and will be using this type of tire when the electric call comer for a change. Instead of wrangling a whole casing off the rim, all you will have to do is run the car ahead a few inches until the deflated section of this ultra modern tire is uppermost. Then you will quickly be able to effect a change of tire with a fresh segment—theoretically. But how about all the friction between “the pieces of pie?” And think of all the signals you’d need! Those tire pressure devices sure took their time coming to market, but they eventually made it. Actually I believe that there has been some progress in developing hybrid airship/winged aircraft. Looking up information about hybrid aircraft, I see the idea is to have them heavier than air, so they can land easily, but just to make them lighter than they might otherwise be. This has started me thinking. The problem with lighter-than-air craft is that they have to release expensive helium to become heavier in order to land – unless they use flammable hydrogen. Perhaps the real hybridization we need is to have a helium balloon airship connected by a rope to a hydrogen balloon above it at a safe distance. A common theoretical airship design envisions hydrogen balloonettes inside the helium gas bags. The hydrogen is connected to the outside world only by the vent at the top while the helium serves as fire-proof insulation. This idea was tried out on…. either the Hindenburg or the Graf Zepp II, but was not utilized because, at the time, the US controlled all of the Helium supplies in the world and FDR refused to release it to the Germans, even for passenger ships. In fact, the Hindenburg was originally designed to use Helium. It took the direct orders of Herman Goering to override Dr. Eckner’s safety concerns. Once it was clear that the US would never release the gas, 11 new passenger cabins were added to take advantage of Hydrogen’s greater lift, taking the passenger compliment from 50 to 74. Another design that was tested from time to time involved using superheaters inside the Helium cells powered either by electricity or exhaust gas from the engines. These heated and expanded the Helium for greater lift at night when cooler temperatures shrank the gas and cut lift and were turned off during the day. An extension of this concept is to use hot air balloonettes along with Helium cells. The ship carries enough Helium to cancel or nearly cancel its weight. Using, again, engine exhaust or electric heaters, the air in these cells is heated to produce the needed lift. when the ship needs to descend, the heat is turned off and the hot air is vented from the top, just as with a hot air balloon. The drawback to this system versus hydrogen balloonettes is that the ship must be built larger to accommodate the fact that hot air has far less lift per unit of volume than either Hydrogen or Helium. John you can see something of your idea in very early airships which had the gondola and engines suspended well below the gas bag. (See, especially, the designs of Alberto-Santos Dumont.) Early ships used gasoline engines with either spark ignitions or open flames. Later, much safer diesels became the norm, but still required a degree of separation. Hence the engine pods of the Hindenburg and Graf Zeppelin versus the inboard engines of the (Helium-filled) American Akron and Macon. The problem with a completely separate balloon is that the drag and control penalties that it would engender would make the ship all but unmanageable and certainly far less efficient. The real benefits of these ships are that the smaller gas bag and greater power to weight ratios allow for greater speed and much greater control, particularly while hovering in cross winds. A secondary benefit is that the greater weight and smaller size makes them much easier to handle and hanger on the ground. Sorry for the rants, I just really have a thing for airships.